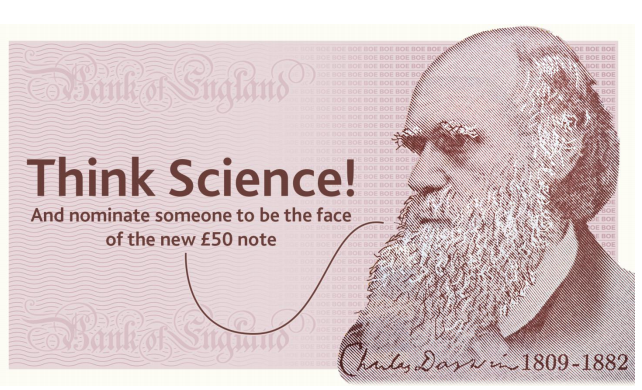 The Bank of England have asked the general public to nominate a historical character who has 'contributed to science and influenced UK society' to be featured on the next £50 note. The news follows initial speculation of the figure to be celebrated on the forthcoming polymer £50 note, and has given the general public a clearer idea of the subject to be honoured on the note. Members of the public have six weeks to nominate a historical character who has contributed to science and influenced UK society. The Governor has also announced the appointment of four experts in the field of science to the Banknote Character Advisory Committee – Dr Maggie Aderin-Pocock, Dr Emily Grossman, Professor Simon Schaffer and Dr Simon Singh. They will join the permanent members on the Committee in creating a shortlist from the range of characters put forward by the public. The Governor will then make a choice from the shortlist and the final decision will be announced in 2019 alongside a concept design for the new note.